Odegaard Undergraduate Library made changes to improve waste diversion throughout the buliding. Paper towel containers were removed from the restrooms and replaced with hand dryer units in the library and By George Cafe in 2014 and 2015, which reduced paper consumption and eliminated costs associated with keeping the restrooms stocked with paper towels. 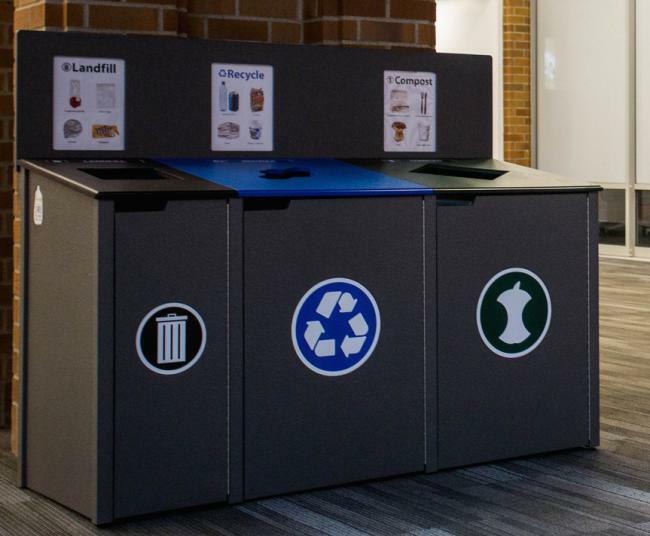 In July 2015, the composting, recycling and landfill bins in the library were replaced with redesigned sorting bin stations which are upcycled from reclaimed milk jugs. The stations include headboards with simplified educational signs to make sorting quick and easy. The new bins also help cut down on overflow issues, and the recycling and compost portions are intentionally larger than the landfill bin to help encourage diverting items from the landfill. Each new sorting bin station is made from approximately 1,485 reclaimed milk jugs.